It's not news that end of life care is broken. A recap from current discussions; Zeke Emmanuel (yes the brother of Rahm, formerly seen around the White House and presently holding offices in Chicago), and others. Every now and then, it is instructive to see what physicians choose for themselves, in end of life health care. See http://www.radiolab.org/story/262588-bitter-end/, and their obvious rejection of continued treatment in situations where the benefits are hard to identify, other than keeping the body alive. Preferences of physician-participants for treatment given a scenario of irreversible brain injury without terminal illness. Percentage of physicians shown on the vertical axis. For cardiopulmonary resuscitation (CPR), surgery, and invasive diagnostic testing, no choice for a trial of treatment was given. Data from the Johns Hopkins Precursors Study, 1998. 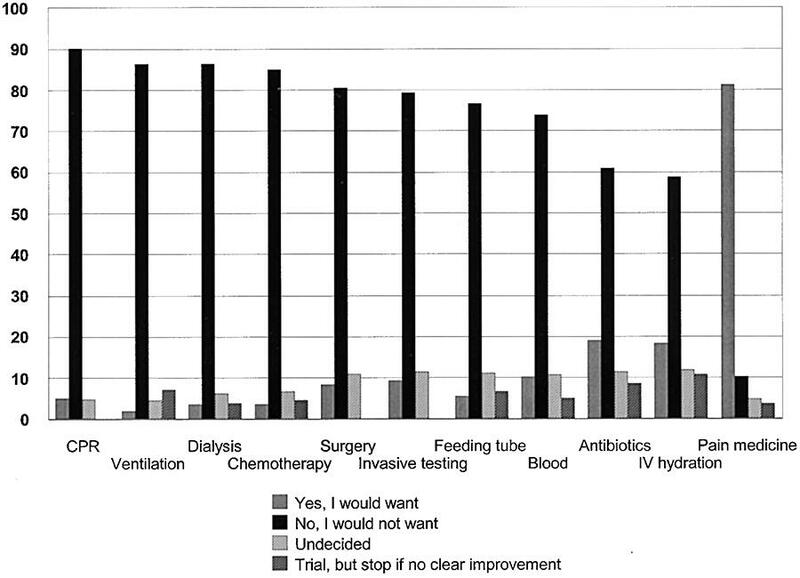 Courtesy of Joseph Gallo, "Life-Sustaining Treatments: What Do Physicians Want and Do They Express Their Wishes to Others?" This blog is about medical ethics, I understand that. But sometimes it's useful to stand back and examine the assumptions of what constitutes "ethics" and "moral behavior." Most of us would, I believe, consider moral and ethical decisions the domain of people rather than machines, but as computers and software that run on them become ever more powerful, some developments are worth keeping an eye on: autonomous machines that are expected to make moral / ethical decisions. $7.5 million is a drop in the very large bucket that could make such a scenario possible, yet the very existence of the bucket should wake us up and think about, and sort out in our heads, what is "right" and "moral" and "ethical." There have been many and complex arguments taking positions at extremes such as "of course computers will be sentient (and soon!)" to "machines can never achieve awareness that humans do," and every slice in between. If you have already thought about what you mean by these words, excellent. If not, now's a good time to wrap one's head around this nontrivial topic. Can an autonomous robot make moral decisions? Public policy on it depends on thoughtful input. The experts and their PowerPoints gathered in the nation’s capital. The purpose was to advance an important effort by the Institute of Medicine to improve communication and understanding between doctors and patients and researchers and subjects. No simple task, this. Best practices were discussed, and one received special attention. Alas, amid the downpour of information during Monday’s daylong webcast of the Institute of Medicine’s workshop on informed consent and health literacy, I seem to have missed this most important of best practices. In particular, this course change demands attention to improved communication skills, so that when a doctor like Jeremy Sugarman of Johns Hopkins tells his patient she has “fibroids in the uterus,” and she hears “fireballs in the uterus,” he’ll know it and correct it. But a malaprop is only a problem if the doctor doesn’t know he or she has been misunderstood. If the doctor knows, a discussion and better understanding might follow. And even, perhaps, truly informed consent. Even among scientists and medical professionals, the obligations and purposes of informed consent are not universally clear, in part because they are not always the same. Consent is better understood as a process than a form, and it differs greatly for a patient than for a research participant (for whom there may be no expected benefit from what is being consented to). And consent forms are full of legalese. The workshop itself neglected patients. Notably missing were patient and community perspectives, but to the credit of the members of the roundtable, and their chair, Dr. George Isham, they won’t long be absent from this process. With patient and community perspectives, the focus might improve. See more about the workshop here. The title is thoughtfully provocative. Does medicine have a soul? Do people? And what happens in the doctor-patient relationship when one answers yes and the other no? As I said, the title is thoughtfully provocative. And here it comes again. “The Soul of Medicine” (Johns Hopkins University Press) is also the title of a 2011 collection of stories co-edited by John R. Peteet and Michael N. D’Ambra and used as the text for “Spirituality and Healing in Medicine,” the course they teach at Harvard Medical School. I was reading Peteet and D’Ambra’s book as a three-day course in bioethics began at Harvard Medical School, which I attended as a member of the Harvard Community Ethics Committee. Neither Peteet nor D’Ambra are faculty for the bioethics course, and their book was not cited. And yet theirs was the text I thought of during a break. A chaplain who had asked several probing questions during a session wondered if she had asked too many. She hadn’t, I assured her. Indeed, I welcomed the questions. They were insightful and brought a wondering and spiritual component into the dialogue. Ethical conflicts in medicine, at least the ones I’ve studied as a member of the Community Ethics Committee, seem to sprout from communication problems and a disconnect between medical expertise and patient values. Since the doctor-patient relationship would be where “medicine may be losing its soul,” understanding and engaging those values is important. Peteet and D’Ambra edited the collection, wrote the preface, and collaborated on chapters with theologian and palliative care expert Michael Balboni and psychologist, ethicist and rabbi Terry Bard. For other chapters, they brought together medical professionals and others with expertise on Judaism, Hinduism, Islam, Christianity, Buddhism, Eclectic Spirituality, Christian Science Jehovah’s Witnesses, A Secular Perspective and a historic context for this complex subject. Perspectives in “The Soul of Medicine” can be contradictory, but such is the nature of the various faiths and spirituality. Dr. David Ring of Massachusetts General Hospital helps explain why science and religion/spirituality are such an uneasy pairing. Through studies of end-of-life care and treating human suffering, the Community Ethics Committee, which hosts this blog, repeatedly considers whether and where spirituality and religious faith belong in the contemporary dialogue about care. Committee members past and present include include a rabbi, an imam, atheists, a Catholic chaplain, a Methodist minister, a professor at a Christian college and a Unitarian. With such a range of perspectives and values, clarity of language and meaning become crucial, says co-founder Carol Powers. The Community Ethics Committee’s top priority is “the patient in the bed,” Powers has said often. But what of those with the daunting challenge of diagnosing and explaining medical problems, and helping patients come to decisions that respect both personal values and what is medically possible? This post also appears at www.paulcmclean.com. Over the coming weeks, I hope to share key take-aways from the Harvard Center for Bioethics’ three-day course in clinical bioethics. Here’s a start. At Massachusetts General Hospital, Guy Maytal holds these titles: associate director of ambulatory psychiatry, director of primary and urgent care psychiatry, and psychiatric liaison to palliative care. He also is involved in ethics consults. You wear that many hats, there is bound to be confusion: So it’s not unusual for him to be called for a psych consult on what is essentially an ethics matter, or for an ethics consult on a psych matter. The lines blur. Maytal once received a call for a consult “because the patient cried.” Which says more about a clinician’s inability to sit with emotion than with any problem on the patient’s part. What do I make it mean? The patient perspective in that last one puts into context how a clinician might confuse psychology and ethics consults. The lines blur, indeed. Videos have come to be regarded by many as a valuable aid in helping patients make decisions about their care when such videos supplement a conversation with a physician that explains possible treatment options. A number of research studies (here, here and here) suggest that such use of videos can lead to more informed patients and, for patients approaching the end of life, a greater likelihood of patients opting for comfort care rather than life prolonging treatments. I would like to express one source of unease with the use of video in this context and identify a possible weakness in the associated empirical studies. An alternative interpretation of the evidence is possible, however. Might not the participants be having an emotional reaction to the video, and might it not be this emotional reaction, not their being more informed, that is causing their comfort care preference? And might not the video group’s generally remembering more information about medical care, as demonstrated in the multiple choice and true/false assessment, also be caused by their emotional reactions to the video? On this reading, it is an emotional reaction to the videos, not their educational effect, that is causing both phenomena identified by the studies - the higher assessment scores and the preference for comfort care. If this were so, a reevaluation of the role of video in informing patients would appear in order. In order to forestall this kind of objection, the authors of one study note that “Participants' comfort level with the video is … reassuring against this possibility [of an emotional reaction’s causing the treatment preference].” One might also question whether an emotional reaction can improve scores on a factual recall assessment. How could that be? I would note, however, that self reported levels of comfort are an unreliable guide to a person’s emotional state, even under normal circumstances, and there is empirical literature suggesting that emotional reactions may indeed lead to more accurate retention of information, a phenomenon that might better explain the video watchers’ scoring better on the factual assessment. It is well known in the field of advertising that coupling a visual emotional trigger with factual information can greatly enhance future recall of that information. This is not a promising analogue for doctor patient communication about end of life care options. The authors of the first video study referenced above concede that “an emotional response to the video could have influenced participants’ preferences,” and immediately follow with “To ensure that the video was not biased toward any particular perspective, the video content underwent extensive scrutiny by numerous oncologists, intensivists, palliative care physicians, and ethicists with particular expertise in this field.” But the problem is that scrupulously guarding against bias in a video does nothing to address the possibility that an emotional response is influencing participants’ preferences. Perhaps the authors’ point is that an accurate video that may indeed provoke an emotional reaction nonetheless has educational value when viewed with a physician in the context of a discussion about treatment options. What can be wrong with seeing for oneself the unbiased reality of each option, even if this elicits an emotional reaction? This may be the crux of the issue. One difficulty is that video images, however deliberately produced and contextualized, and however true to the patient’s prognosis, have a power to subvert other, more subtle imaginative resources that we draw from in making informed personal choices. The professional lens through which a physician views and interprets an image of a patient receiving treatment is utterly different from that which shapes a patient’s apprehension of the same image. By contrast, with the standard model of doctor-patient communication, a skilled physician can determine her patient’s reception of her explanation of treatment options and take account of this reaction in guiding conversation. The reading of emotional cues and the making of adjustments may not be possible with a video as part of the interaction, giving less assurance that patient reactions are understood, acknowledged, and balanced. The role of emotions in patient decision-making is so complex, and the content of the videos (I’ve seen them) powerful enough that a shift in patient preferences of the kind observed in these studies should give us pause. While all acknowledge that aids to genuinely informed end of life decision making are increasingly necessary, perhaps the jury ought still to be out regarding the role of video in this context.